Words to The Wise ~ take care of yourself! Need Health Insurance? Free Quotes are Available Online without obligation! Over 40 million Americans are without health insurance. If you are looking for insurance for yourself, your family, or a small business group. Try eHealthInsurance and find the plan that's right for you. 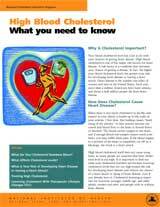 This brochure provides information about how to lower a cholesterol level that is too high. Lowering a cholesterol level that is too high helps to reduce the risk for heart disease. Find out what your cholesterol numbers mean and what treatment your doctor may prescribe to help lower your cholesterol level. Includes a tool to estimate the risk for having a heart attack, and outlines ways to reduce risk. Also contains a list of resources for further information. Click on brochure and you'll have the option of opening it in either PDF or HTML (web) format. Be sure to check out The National Cholesterol Education Program's popular interactive website, Live Healthier, Live Longer.